Your teeth and braces MUST be kept clean every day. It is best to brush after EVERY meal and be sure to gently massage your gums. The brackets and bands should remain bright and shiny and your gums should stay pink and firm. Failure to maintain good oral hygiene can lead to permanent white scars on your teeth, cavities/tooth decay, and gum disease or bone loss. In extreme cases it may force us to discontinue treatment before an ideal result is achieved. It is important for you to continue to see your regular dentist for exams and cleanings during your orthodontic treatment. BRUSH your teeth after every meal! Make sure you remove ALL of the food and plaque on top of and below your braces. Use a soft toothbrush with a small amount of fluoride toothpaste. Use light pressure with a circular motion around each bracket and along the gumline for about 10 seconds on each tooth. Brush every tooth slowly and make sure you don’t leave any food particles or plaque, especially at the gumline. Angle the bristles of your toothbrush between the braces and the gumline. Don’t forget to brush your tongue and the roof of your mouth. 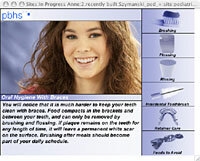 FLOSS NIGHTLY after brushing to remove the food and plaque in between your teeth that you cannot get by brushing alone. Use a floss threader to pull the floss underneath the wire. Floss carefully around each tooth and bracket using a C shape. Floss all the way up under the gum area on both sides of each tooth. Use a new section of floss each time. RINSE with a fluoride mouthwash! Rinse AFTER you brush your teeth for at least 30 seconds. DON’T rinse with water afterward to ensure fluoride coats your teeth to protect against cavities. All ACT mouthwash contains fluoride so you don’t have to get the BRACES CARE specific bottle. If your gums are swollen and sore, you can switch off between ACT and Listerine antiseptic to help with gingival inflammation. Make sure to floss daily to remove all of the plaque under the gumline. White Spot Lesions are PERMANENT white SCARS that NEVER go away. They are the start of a cavity or hole in your tooth. White spot lesions and cavities can be AVOIDED during your orthodontic treatment if you maintain good oral hygiene. PLEASE DON’T LET THIS HAPPEN TO YOU … simply BRUSH, FLOSS & RINSE every day to keep your teeth and smile healthy! At OAI we would have removed the braces earlier to prevent irreversible tooth damage, but as you can see in the examples below from another office, the orthodontic treatment goals were not complete. Remember to continue to visit your dentist for routine cleanings during your orthodontic treatment at least 2X per year. They can clean around the brackets to keep your teeth and gums healthy!